Be the first to share your favorite memory, photo or story of Elmer. This memorial page is dedicated for family, friends and future generations to celebrate the life of their loved one. Elmer Bayless DeMoss, affectionately known as the "Urban Farmer," almost made it to be 100 years old. Bayless was born Aug. 18, 1919, in Pryor, OK, to Elmer and Le Nora DeMoss. On New Year’s Day 1940, he and the former Maxine Laird were married. This union lasted 45 years until Maxine’s death in 1985. After serving in the United States Navy, Bayless began a career at Continental Oil Company. He retired in 1980 after 40 years there. In March 1986, Bayless married the former Ruth Dickerson. In his later years, Bayless gave up his beloved hobbies of woodworking, antique tractor restoration, and construction, but still worked on his magnificent vegetable garden for as long as he could. Bayless spent many winters making jelly, candy and jerky… he always gave away more than he ever kept. He never met a stranger and always made everyone feel welcome. His jovial nature was appreciated by all his caregivers, friends, and family, who absolutely loved him. He was a devoted 33-year member of Northeast Baptist Church and attended regularly. He was preceded in death by his first wife, Maxine DeMoss, his parents, Elmer and Nora DeMoss, brother, Roy Dean DeMoss, and sisters, Anna Lee, Betty, and Marcelle. Bayless is survived by his wife, Ruth DeMoss, children, Trish DeMoss Dilbeck, Jerry DeMoss and wife, Tommye, step-son, Dwain Dickerson and wife Rosemary, sister, Charlene Frost, grandchildren, Brandon Dilbeck, Gary DeMoss and wife Gabby, Doug DeMoss and wife Jean, Deanna Morris and husband Brian, step-children, Cindy and husband Cecil, Dwain Dickerson, Jr. and wife Lisa, step-grandchildren, TJ Cosper, Heather Smithson, great-grandchildren, Gregory DeMoss, Jason DeMoss, Timothy Culbertson, and several step-great-grandchilden. Friends and family may pay their respects at Trout Funeral Home on Monday, March 18, 2019 from 5:00 pm until 7:00 pm. A funeral ceremony to celebrate his life will be held on Tuesday, March 19, 2019 at 2:00 pm at the Northeast Baptist Church. Following the ceremony, he will be laid to rest at Odd Fellows Cemetery. Memorial contributions may be made to Northeast Baptist Church, 2200 N Pecan Rd, Ponca City, OK 74604 or Hospice of North Central Oklahoma, 445 Fairview Ave., Ponca City, OK 74601. 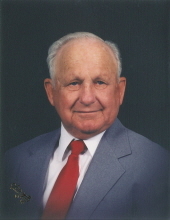 To send flowers or a remembrance gift to the family of Elmer Bayless DeMoss, please visit our Tribute Store. "Email Address" would like to share the life celebration of Elmer Bayless DeMoss. Click on the "link" to go to share a favorite memory or leave a condolence message for the family.